Keep your feet feeling dry and refreshed no matter what exercise you might be doing with these Nike Dri-FIT Lightweight No Show Training Socks in Black and Anthracite. 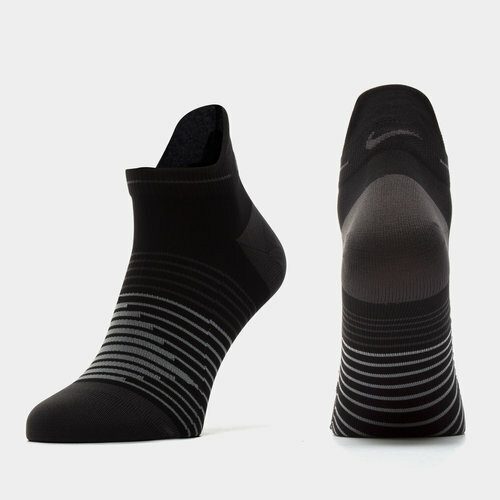 These trainer socks from Nike feature a low cut collar that sits just above the ankle, allowing them to be subtly hidden and not cramp your style. These socks feature anti-blister cushioning and reduces friction to avoid your feet from generating unnecessary extra heat. Made to be lightweight, incorporated within these socks is Nike Dri-FIT technology which helps keep your feet feeling cooler, drier and more refreshed by absorbing sweat and quickly drying. This cooling effect is enhanced thanks to mesh ventilation. Ensure your feet are comfy and dry when you engage in even the most intense of training sessions by wearing these Nike Dri-FIT Lightweight No Show Training Socks.